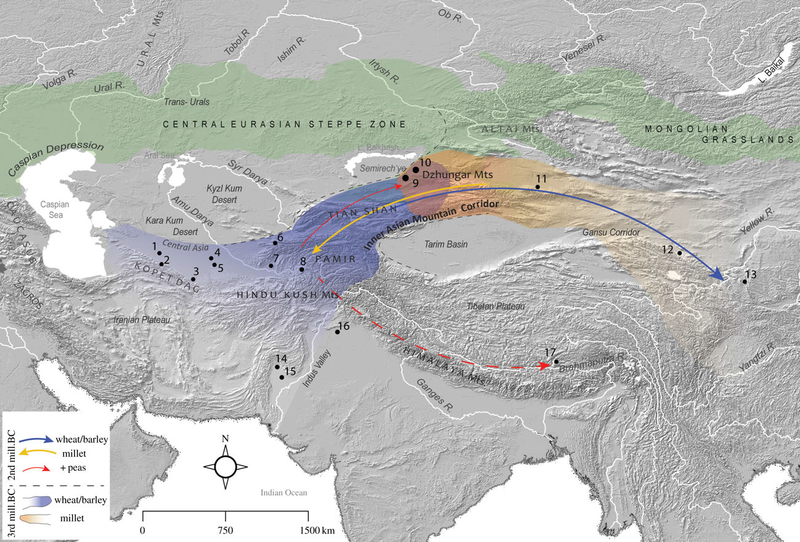 Could this be evidence of migratory activity before the Afanasevo culture? It would be interesting to think of the possibility of an earlier Indo-Iranian presence in the area south of the steppe. Do you know what populations are genetically (not linguistically or culturally) closest to Bulgarians? Does the paper make any reference to the climate of the Tarim basin region in the third millennium BC? One of the big mysteries of the proto-Indo-European concept has been how so much agricultural vocabulary would end up in a proto-language spoken by pastoralists. This study helps to bridge that gap. "end forth millenium BC first bronze objects appeared in northwest China, i wonder if this came through the same corridor"
Probably so. Native development of bronze technology seems unlikely, at this point. "Could this be evidence of migratory activity before the Afanasevo culture?" "I believe that Lop Nur at the eastern edge was wetter at one time but perhaps the whole area, like the Sahara, had a wetter climate which allowed agriculture and mixing of grain technology "
There is evidence of agriculture made possible by irrigation in the Tarim Basin, but as I recall it is relatively late, 1st millennium BCE, at the earliest. The biggest mental wall that this goes to correcting is the misperception that "nomadism" = "primitive, ignorant, lawless," etc. Quite the contrary in some cases. Before airplanes and the internet, only nomads would be in a position to see and select/distill the best of everything from the surrounding peasant cultures they came in contact with in their travels. "The biggest mental wall that this goes to correcting is the misperception that "nomadism" = "primitive, ignorant, lawless," etc.?" Ignorant, certainly not, in some things, but one would expect people who don't practice agriculture to know much less about that than people who do. The "lawless" claim has a lot more merit. Yes, nomadic pastoralists had and still do have laws, often strict ones. But, these are generally culture of honor "laws of the clan" type regimes, rather than the rule of law, reason and principle and evidence based laws of sedentary agriculturalists or urbanites. Trial by combat, for example, was common place in nomadic pastoralist societies well into the migration period in the Middle Ages in Europe, and dueling to settle disputes, bride abduction, and aggressive used of "self-help" to redress perceived grievances were the norm in many cultures of honor worldwide (including those in the U.S.) with roots in pastoralist economic regimes at least through the 19th century. Now, that "lawless" component also translated into "badass" and "ruthless" which is a really useful thing when crops are failing and civilization is collapsing due to prolonged droughts or global temperature changes. Pastoralists have historically filled the vacuum and created empires when settled people are weak, and then retreated or been assimilated when settled civilizations are healthy during more favorable climate periods. This paper, of course, illustrates that there are intermediate options between the platonic ideals of nomadic pastoralists and sedentary farmers. It would seem obvious that the origin and use of domestic cereals and taurine cattle would go hand in hand given that one fed on the other in its wild state. The domestication of the wild auroch is probably owed to selective culling on open grasslands, not captive breeding, at least until much later. Those native grasses would have been threshed for additional food in the Mesolithic and eventually maturing in the Neolithic. Central Asia probably has quite a few more surprises to offer. It's hard to imagine a scenario where both weren't originally present and complementary. If a savannah herder doesn't thresh (even wild grass), what does he eat the other six days a week? There are probably more surprises yet to come from Central Asia. "One of the big mysteries of the proto-Indo-European concept has been how so much agricultural vocabulary would end up in a proto-language spoken by pastoralists." I'm not sure why there should be a mystery given that PIE were literally adjacent to Cucuteni(agriculturists) for a very long time until Cucuteni disappeared - which by a strange coincidence was around the time PIE got themselves riding horses. "Frachetti on the multiregional emergence of mobile pastoralism"
Mehrgarh and Indus Valley are 7000 BC agrarian societies. Trade between plains and mountains is common phenomena. It's odd such a close ancient society is not mentioned. I think the most exciting and curious point raised (beginning around 29 minutes in the lecture) was that the Afanesevo culture might not be related to the Yamna culture further West, but could be related to sites in the Inner Asian Mountain Corridor, and sites further South. I know David Anthony favours the Yamna culture spreading to Afanesevo culture, but this paper and other views might raise certain objections. The dating given to these two sites are extremely close with 3500 BCE for Yamna, and 3300 BCE for Afanasevo, but are separated by a huge distance of almost 2000 km (although there are figures that date Afanasevo to 3700 BCE). To make this even more confusing, they have the Botai culture in between them, which is also dated to around 3700 BCE, which doesn't seem to be affected by either culture. Anthony believes that the Yamna to Afanasevo is perhaps documenting the travel of groups that would give rise to the Tocharian speaking people who appear in the Tarim Basin almost 3100 years after Afanasevo is thought to have ended. I think we still have a lot to learn about the origins of Yamna and Afanasevo. Sorry, that lecture by James Mallory is from 2012, not 7 months ago! @Atlantis, some British and American academics are biased against any Paleo-Euro relation to Tocharians or anything in the east. It's in part because if the "no migration" paradigm of Anglophone archaeology that has been seriously challenged by new DNA evidence. Frachetti and Renfrew's work derives from this school of thought. Doesn't make their findings correct or incorrect, but that is their paradigm. There are some major problems with the Kurgan paradigm too (like - how does Anatolia fit in? Not to mention West Asia in general, which we know was beaucoup important for Scythians / Cimmerians). Mallory is being a good sport and playing along - but that doesn't mean his work didn't have a great deal of substance that must be acknowledged (even if modified, amended, or corrected in places). "Kurgan" is just a shorthand for a multi faceted phenomenon that is clear enough in the archaeological record. What exactly that was, and how it relates to ANE etc remains to be fully examined. Farmana will be a make or break moment for these academics. Which is probably why publication has been delayed so long.